Hue Jackson is tired of being asked about the Cleveland Browns‘ QB depth chart. It becomes more obvious each time he answers questions about it. Jackson’s response has been the same all along – “Tyrod Taylor is our starter.” He said it when the Browns traded for the veteran in March, when they drafted rookie Baker Mayfield the following month, when the team entered OTAs and, this week, when training camp opened. The only change has been a steady increase in emphasis. I’ll go on record as saying I agree with Jackson’s approach to the quarterback situation. I also know maintaining said plan is about to become significantly more difficult. It’s surprising, honestly, especially when you consider how solid the Browns’ current approach is with a position they always screw up. They have a proven vet (Taylor) who ensures they don’t need to rush the promising rookie (Mayfield) onto the field, and have also provided said rookie a mentor (Drew Stanton) whose primary focus is helping him adjust to the pros. On paper, it’s a fundamentally sound setup. I understand those who think Mayfield should start based on his status as the first overall pick and quarterback of the future. However, I also know Jackson and company have plenty of scars after throwing an unprepared rookie to the wolves last season. As a result, I’m aligned with the idea of easing the pressure off Mayfield and rolling with an established veteran in Taylor. With training camp, though, comes the true pressure test. Cleveland’s setup may seem foolproof now, but maintaining it through the next few weeks is going to become trying. No matter how many times Jackson puts his foot down in saying Taylor is his starter, Mayfield will still be the focus of everyone’s attention. The second he appears up to speed, coaches and players alike will be peppered with questions about his readiness. If Mayfield looks like he can start now, they’ll ponder, why make him wait on the bench? One would think this could be easily dismissed by pointing out the difference between simulated drills and live-game action. However, these things are typically ignored when you’re talking about the top pick of a quarterback-starved franchise. If Jackson thinks the questions about starting Mayfield over Taylor are annoying now, just wait until preseason. Naturally, the lower you are on the depth chart, the more preseason snaps you get. Taylor will likely only see significant action in one of the exhibition games, so these contests will be an opportunity for Mayfield to show his growth. Should he perform well, it’ll be yet another hurdle for the Browns to deal with in their attempts to red-shirt him this year. The outside pressure insisting on starting Mayfield will ramp up despite the fact he’s taking the bulk of his snaps against second and third stringers. It’ll increase despite the fact he’s facing relatively vanilla defensive schemes. It’ll grow louder despite the fact Taylor won’t receive enough playing time to make his case. These are all reasons why we shouldn’t overreact if Mayfield has a solid preseason. They’re also things people will have no trouble overlooking when asking Jackson why he isn’t starting his rookie over Taylor. I do hope the Browns are able to maintain their plan, provided Taylor continues to look like the correct choice at least. As mentioned, it’s the first time this team has taken a smart approach to this position from all angles. 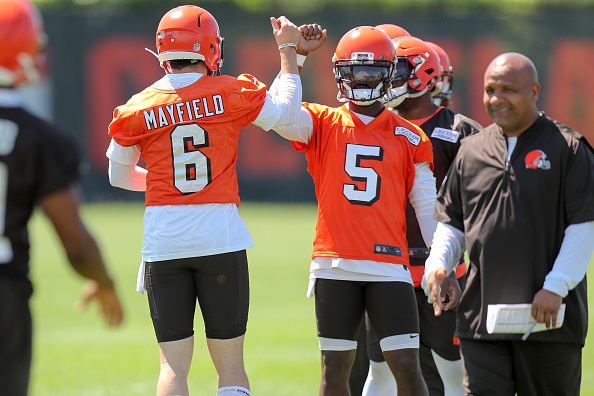 However, it’s going to take very little – a solid day of camp, a great preseason performance – to make people start questioning why Mayfield isn’t on the field come Week 1. I hope Jackson is prepared to stay the course despite this, as the pressure to shake things up is going to be mounting like never before in the next few weeks.